The following are the Lotto results for Friday, 21st Nov 2014. Numbers draw: 10, 19, 24 & 27. There was no jackpot winner. Spot prizes: â¬50 Davina Carey, Lavally, â¬30 Timmy Mahony, Castletownroche, â¬20 Attracta O'Sullivan, Mallow, â¬20 Sarah Lee, Lahakineen, â¬20 M. Nagle, Mallow. Next jackpot â¬12,500. Draw takes place Friday, 28th Nov 2014 in Conway's Bar, Burnfort. The following are the Lotto results for Friday, 14th Nov 2014. Numbers draw: 8, 13, 20, 32. There was no jackpot winner. Spot prizes: â¬50 Eva & Aisling O'Donoghue, C/o The Hill Bar, â¬30 Ted & Sheila Curtin, Ballyknockin, â¬20 Denis Carey, Toureen, â¬20 Aisling Cronin, Ballyphilibeen, â¬20 John Goulding, Fidane. Next jackpot â¬12,500. Draw takes place Friday, 21st Nov 2014 in Railway Bar, Ballinamona. The following are the Lotto results for Friday, 7th Nov 2014. Numbers draw: 5, 6, 22, 29. There was no jackpot winner. Spot prizes: â¬50 Maurice O'Brien, Dromore, â¬30 Frank Atkinson, Clashmorgan, â¬20 Dan Sullivan, Bottlehill, â¬20 Keith Neville, Monaparson, â¬20. Next jackpot â¬12,500. Draw takes place Friday, 14th Nov 2014 in Conways Bar, Burnfort. The following are the Lotto results for Friday 31st October. Numbers drawn: 3,15,24,27. There was no jackpot winner. Spot Prizes: â¬50 Willie OâConnor, The Shoe, Mallow; â¬30 Jerry Burke, Monaparson; â¬20 Eoin Cahill, C/o Bottlehill; â¬20 Eileen OâConnell, Ballinamona; â¬20 Ella Looney, C/o Ollie Looney. Next jackpot â¬12,500. Draw takes place on Friday, 7th November in Conways Bar, Burnfort. The following are the Lotto results for Friday 24th October. Numbers drawn: 7,8,13,29. There was no jackpot winner. Spot Prizes: â¬50 Eamon Connolly, C/o Bottlehill; â¬30 Thomas Harold, Clashmorgan; â¬20 Kathleen Browne, Burnfort; â¬20 Martin Coleman, Rathduff; â¬20 Mary OâShea, C/o Juvenile Club. Next jackpot â¬12,500. Draw takes place on Friday, 31st October in Railway Bar, Ballinamona. The following are the Lotto results for Friday 17th October. Numbers drawn: 7,20,22,24. There was no jackpot winner. Spot Prizes: â¬50 Dan OâSullivan, Garrynagearagh; â¬30 Breda Kelly, C/o Juvenile Club; â¬20 Mick OâConnell, Upper Quartertown; â¬20 Tom McGlinchey, Newport; â¬20 Leona Cronin, Burnfort. Next jackpot â¬12,500. Draw takes place on Friday, 24th October in OâMahoneyâs Bar, Bottlehill. The following are the Lotto results for Sunday 12th October. Numbers drawn: 1,4,5,21. There was no jackpot winner. Spot Prizes: â¬50 Kevin Lynch, c/o D J Browne; â¬30 Mary OâConnell, Lissard; â¬20 Mary Buckley, Croke Place, Mallow; â¬20 Tess Finn, Dromahane; â¬20 Teddy OâShea, Ballyclough. Next jackpot â¬12,500. Draw takes place on Friday, 17th October in Conways Bar, Burnfort. The following are the lotto results for Friday 3rd October . Numbers drawn 15,17,18,22. There was no jackpot winner. Spot Prizes: â¬50 Frank Atkinson Mourneabbey, â¬30 Cormac O Sullivan Garrynagearagh, â¬20 Katie Murphy Rathduff, â¬20 Patrick Ryan Lissard, â¬20 Noreen O Mahony Bottlehill. Next jackpot â¬12,500. Draw takes place on Friday 10th October in The Railway Bar Ballinamona. The following are the Lotto results for Friday 26th September. Numbers drawn: 4,18,22,27. There was no jackpot winner. Spot Prizes: â¬50 Aoife Buckley, Knockbrack; â¬30 Ted Linehan, Cahir; â¬20 Roy Willies, C/o Railway Bar; â¬20 Mary Golden, C/o J OâDonoghue; â¬20 Jerry OâDonoghue, Knuttrey. The following are the Lotto results for Friday 19th September. Numbers drawn: 3,16,24,29. There was no jackpot winner. Spot Prizes: â¬50 Jeremiah Ronayne, Lavally; â¬30 John Golden, C/o J OâDonoghue; â¬20 Tom Murphy, Newgrove; â¬20 Noreen Harold, Clashmorgan; â¬20 Gareth OâHanlon, Burnfort. Next jackpot â¬12,500. Draw takes place on Friday 26th September in Conway Bar, Burnfort. The following are the Lotto results for Friday 12th September. Numbers drawn: 4,8,11,29. There was no jackpot winner. Spot Prizes: â¬50 Niall Crowley, Glynn; â¬30 Ann Hayes, Island; â¬20 Jerry Connell, Island; â¬20 Jerry Healy, Island; â¬20 Ray Browne, Ballinvoskig. Next jackpot â¬12,500. Draw takes place on Friday 19th September in Railway Bar, Ballinamona. The following are the Lotto results for Friday 5th September. Numbers drawn: 2,21,22,28. There was no jackpot winner. Spot Prizes: â¬50 Colman Walsh, Island; â¬30 Vincent OâConnor, C/o J OâDonoghue; â¬20 Mick Cashman, C/o Hill Bar; â¬20 Jerry OâDonoghue, Knuttrey; â¬20 Bobby Deane, Burnfort. Next jackpot â¬12,500. Draw takes place on Friday 12th September in OâMahoneyâs Bar, Bottlehill. The following are the Lotto results for Friday 29th August. Numbers drawn: 17,20,26,28. There was no jackpot winner. Spot Prizes: â¬50 Derek OâBrien, Lavally; â¬30 Jerry Walsh, Mallow; â¬20 Wendy Walsh, 8 Croke Place, Mallow; â¬20 Denise Walsh, 8 Croke Place, Mallow; â¬20 Patsy Mahoney, Kilworth. Next jackpot â¬12,500. Draw takes place on Friday 5th September in Conways Bar, Burnfort. 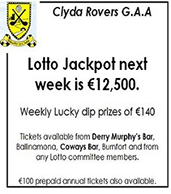 Lotto results for for Friday, 15th August. Numbers drawn: 2,3,12,31. No jackport winner. Spot prizes â¬50 Aoife Buckley, Knockbrack; â¬30 Jerry O'Sullivan, Island; â¬20 Mick Cashman, The Hill; â¬20 Samuel & Aaron O'Callaghan, c/o Juvenile Club; â¬20 Tom Dorgan, Toureen. Next jackpot â¬12,500. Draw takes place on Friday 5th September in OâMahoneys Bar, Bottlehill. . The following are the Lotto results for Friday 8th August. Numbers drawn: 6,13,19,31. There was no jackpot winner. Spot Prizes: â¬50 Pat Moynihan, Rathduff; â¬30 Sinead OâSullivan, Monaparson; â¬20 T J Lyons, Mallow; â¬20; Michael Henry Walsh, c/o Colman Walsh; â¬20 Cormac OâSullivan, Garranagearagh. Next jackpot â¬12,500. Draw takes place on Friday 15th August in Conways Bar, Burnfort. The following are the Lotto results for Friday 1st August. Numbers drawn: 5,10,17,18. There was no jackpot winner. Spot Prizes: â¬50 Cian & Eoin Walsh, Clashmorgan; â¬30 Eileen OâSullivan, Ballyhillogue; â¬20 Sheila Looney, Island; â¬20; Liam Cronin, Ashbrook, Mallow; â¬20 Dan OâSullivan, Bottlehill. Next jackpot â¬12,500. Draw takes place on Friday 8th August in Railway Bar, Ballinamona. The following are the Lotto results for Friday 25th July. Numbers drawn: 11,18,26,29. There was no jackpot winner. Spot Prizes: â¬50 Noel Carey, Lavally; â¬30 Frank Atkinson, C/o Railway Bar; â¬20 Mrs. Oâdonohue, The Shop; â¬20; Derry Donovan, C/o Apple Computers; â¬20 Linda Tanner, Castlebarrett. Next jackpot â¬12,500. Draw takes place on Friday 1st August in OâMahoneys Bar, Bottlehill. The following are the Lotto results for Friday 18th July. Numbers drawn: 11,14,17,31. There was no jackpot winner. Spot Prizes: â¬50 Jerry OâConnell, Island; â¬30 Mary Healy, C/o Jerry OâDonoghue; â¬20 Niall Crowley, Glynn; â¬20; James Hanlon, Dromahane; â¬20 Nuala Cronin, Killavullen. Next jackpot â¬12,500. Draw takes place on Friday 25th July in Conways Bar, Burnfort. The following are the Lotto results for Friday 11th July. Numbers drawn: 1,6,10,28. There was no jackpot winner. Spot Prizes: â¬50 Brendan Cronin, Barrinclay; â¬30 Pierce Buckley, C/o Juvenile Club; â¬20 Tom OâCallaghan, C/o Jerry OâDonoghue; â¬20; Buckley Family, Monaparson; â¬20 Caoilfhoinn Brophy, Clashmorgan. Next jackpot â¬12,500. Draw takes place on Friday 18th July in Railway Bar, Ballinamona. The following are the Lotto results for Friday 4th July. Numbers drawn: 2,3,5,13. There was no jackpot winner. Spot Prizes: â¬50 Michael Murphy, Dromahane; â¬30 Kitty Wlash, 8 Croke Place, Mallow; â¬20 Andrea & Sean Hayes, Ballyknockin; â¬20; Michael Cashman, Hill Bar; â¬20 Martin Coleman, Rathduff. Next jackpot â¬12,500. Draw takes place on Friday 11th July in OâMahoneys Bar, Bottlehill. The following are the Lotto results for Friday 27th June. Numbers drawn: 3,14,25,32. There was no jackpot winner. Spot Prizes: â¬50 Sean Williams, Island; â¬30 Martin Doherty, Newmarket; â¬20 Jillian Cronin, Barrinclay; â¬20; Eamon Geurin, Lombardstown; â¬20 Jerry OâDonoghue, Knuttrey. Next jackpot â¬12,500. Draw takes place on Friday 4th July in Conways Bar, Burnfort. The following are the Lotto results for Friday 20th June. Numbers drawn: 1,3,19,23. There was no jackpot winner. Spot Prizes: â¬50 Jerry OâSullivan, Island; â¬30 Ted & Sheila Curtin, Ballyknockin; â¬20 Dermot Meaney, Rockforest; â¬20; Nevilleâs Dog, C/o Railway Bar; â¬20 Derry Murphy, Ballinamona. Next jackpot â¬12,500. Draw takes place on Friday 27th June in Railway Bar, Ballinamona. The following are the Lotto results for Friday 13th June. Numbers drawn: 4,20,21,28. There was no jackpot winner. Spot Prizes: â¬50 Martin Coleman, Rathduff; â¬30 Timmy Mahoney, Castletownroche; â¬20 Brendan Cronin, Barrinclay; â¬20; Mary Buckley, 8 Croke Place, Mallow; â¬20 Mary Golden, C/o J OâDonoghue. Next jackpot â¬12,500. Draw takes place on Friday 20th June in OâMahoneyâs Bar, Bottlehill. The following are the Lotto results for Friday 6th June. Numbers drawn: 5,7,8,26. There was no jackpot winner. Spot Prizes: â¬50 Ann Bradford, Ballyphilibeen; â¬30 Celine OâConnell, Kilquane; â¬20 Paddy OâConnor, Ballinamona; â¬20; Jerry Burke, Monaparson; â¬20 Sarah Jane Galvin, Buttevant. Next jackpot â¬12,500. Draw takes place on Friday 13th June in Conwayâs Bar, Burnfort. The following are the Lotto results for Saturday 31st May. Numbers drawn: 6,18,19,31. There was no jackpot winner. Spot Prizes: â¬50 John Hanley, Burnfort; â¬30 Liz Walsh, C/o Juvenile Club; â¬20 Rachel Murphy, Glynn; â¬20; The Hill Society, C/o Hill Bar; â¬20 John Dorgan, Island. Next jackpot â¬12,500. Draw takes place on Friday 6th June in Railway Bar, Ballinamona. The following are the Lotto results for Friday 23rd May. Numbers drawn: 9,10,15,29. There was no jackpot winner. Spot Prizes: â¬50 Jimmy McGlinchey, Toureen; â¬30 Susan Dempsey, Knockbrack; â¬20 Jerry Hegarty, Dromore; â¬20; Rachel Murphy, Glynn; â¬20 Patsy Buckley, Glynn. Next jackpot â¬12,500. Draw takes place on Saturday 31st May in OâMahoneyâs Bar, Bottlehill. The following are the Lotto results for Friday 16th May. Numbers drawn: 6,10,13,23. There was no jackpot winner. Spot Prizes: â¬50 Noel OâSullivan, Ballyhillogue; â¬30 Ann Bradford, Ballyphilibeen; â¬20 Tim Ring, Lombardstown; â¬20; Barry Kennedy, Glenville; â¬20 Mary Cronin, Farran. Next jackpot â¬12,500. Draw takes place on Friday 23rd May in Conways Bar, Burnfort. The following are the Lotto results for Friday 9th May. Numbers drawn: 10,17,18,30. There was no jackpot winner. Spot Prizes: â¬50 Noreen OâMahoney, Bottlehill; â¬30 William Cronin, Monaparson; â¬20 Racing Club, C/o Hill Bar; â¬20; John Goulding, C/o Juvenile Club; â¬20 Colette Creedon, Clogheen. Next jackpot â¬12,500. Draw takes place on Friday 16th May in Railway Bar, Ballinamona. The following are the Lotto results for Friday 2nd May. Numbers drawn: 11,14,23,30. There was no jackpot winner. Spot Prizes: â¬50 Siobhan Forde, C/o J OâDonoghue; â¬30 Mick Cashman, C/o The Hill Bar; â¬20 David Sheehan, Mallow; â¬20; Karen OâConnell, C/o Juvenile Club; â¬20 Martin Regan, Glenville. Next jackpot â¬12,500. Draw takes place on Friday 9th May in OâMahoneyâs Bar, Bottlehill. The following are the lotto results for Friday 25th April. Numbers drawn 3,12,29,32. There was no jackpot winner. Spot prizes; â¬50 Eanna Garvey c/o juvenile club, â¬30 Catriona & Eabha Ambrose c/o The Hill Bar, â¬20 Mick Cashman c/o The Hill Bar, â¬20 Tom O Flynn c/o Sinead Ambrose, â¬20 Dan Donoghue Kildinan. Next jackpot â¬12,500. Draw takes place on Friday 2nd May in Conways Bar Burnfort. The following are the Lotto results for Sunday 20th April. Numbers drawn: 9,10,27,28. There was no jackpot winner. Spot Prizes: â¬50 Maire Fitzpatrick, Garranagearagh; â¬30 Carmel Conroy, Clogheen; â¬20 Roy Browne, Ballinvoskig; â¬20; Jerry Walsh, Mallow; â¬20 Caoilfhoinn Brophy, Clashmorgan. Next jackpot â¬12,500. Draw takes place on Friday 25th April in OâMahoneyâs Bar, Bottlehill. The following are the Lotto results for Friday 11th April. Numbers drawn: 18,21,22,28. There was no jackpot winner. Spot Prizes: â¬50 Ber Sheehan, Island; â¬30 Kira OâSullivan, Ballyknockin; â¬20 Gavin Carey, Lavally; â¬20; Eileen Curtin, Ballyknockin; â¬20 Eily Duggan, Dromore. Next jackpot â¬12,500. Draw takes place on Sunday 20th April in Railway Bar, Ballinamona. The following are the Lotto results for Friday 4th April. Numbers drawn: 3,19,29,30. There was no jackpot winner. Spot Prizes: â¬50 Liam & Eddie Hennigan, C/o Juvenile Club; â¬30 Adam Walsh, Ballyphilibeen; â¬20 Marie Kelly, Ballyhillogue; â¬20; John Murphy, C/o D J Browne; â¬20 Billy Barry, Ballinamona. Next jackpot â¬12,500. Draw takes place on Friday 11th April in Conwayâs Bar, Burnfort. The following are the Lotto results for Friday 28th March. Numbers drawn: 5,15,20,26. There was no jackpot winner. Spot Prizes: â¬50 Noel Carey, Lavally; â¬30 Noel OâCallaghan, Knuttrey; â¬20 Tom McGlinchey, Newport; â¬20; Dinny Donovan, Apple Computers; â¬20 Willie OâRegan, 31 Collins Place, Mallow. Next jackpot â¬12,500. Draw takes place on Friday 4th April in Railway Bar, Ballinamona. The following are the Lotto results for Friday 21st March. Numbers drawn: 1,5,15,24. There was no jackpot winner. Spot Prizes: â¬50 Collette Ryan, Lissard; â¬30 Andrea & Sean Hayes, Ballyknockin; â¬20 Fergal Cronin, 12 Dernville, Mallow; â¬20; John Forde, Knockbrack; â¬20 Joan Murphy, C/o J OâDonoghue. Next jackpot â¬12,500. Draw takes place on Friday 28th March in OâMahoneyâs Bar, Bottlehill. The following are the Lotto results for Friday 14th March. Numbers drawn: 1,21,22,24. There was no jackpot winner. Spot Prizes: â¬50 Eileen OâConnell, Ballinamona; â¬30 Ann Hayes, Island; â¬20 Bridie McGlinchey, Toureen; â¬20; Noel OâSullivan, Ballyhillogue; â¬20 Bridie McGlinchey, Toureen. Next jackpot â¬12,500. Draw takes place on Friday 21st March in Conways Bar, Burnfort. The following are the Lotto results for Friday 7th March. Numbers drawn: 2,15,23,25. There was no jackpot winner. Spot Prizes: â¬50 Mary OâMahoney, Bottlehill; â¬30 Mary Golden, Nadd; â¬20 Sheila Ronayne, Lavally; â¬20; Aisling Murphy, Ballinamona; â¬20 Ned Cronin, Ballymartin. Next jackpot â¬12,500. Draw takes place on Friday 14th March in Railway Bar, Ballinamona. The following are the Lotto results for Friday 28th February. Numbers drawn: 4,25,26,28. There was no jackpot winner. Spot Prizes: â¬50 Fiachra Carey, Lavalley; â¬30 Cormac Looney, Island; â¬20 Eily Duggan, Dromore; â¬20; Tom Cashman, C/o The Hill; â¬20 Kit OâShea, Burnfort. Next jackpot â¬12,500. Draw takes place on Friday 7th March in OâMahoneyâs Bar, Bottlehill. The following are the Lotto results for Friday 21st February. Numbers drawn: 11,20,28,29. There was no jackpot winner. Spot Prizes: â¬50 Derry Murphy, Ballinamona; â¬30 Michael OâConnell, C/o Juvenile Club; â¬20 Liam Cronin, Ashbrook, Mallow; â¬20; Dan OâSullivan, Garranagearagh; â¬20 Mary E OâConnell, Lissard. The following are the Lotto results for Friday 14th February. Numbers drawn: 18,19,22,27. There was no jackpot winner. Spot Prizes: â¬50 Maureen Cronin, Monaparson; â¬30 Derry Murphy, Ballinamona; â¬20 Noreen OâMahoney,Bottlehill; â¬20; Jeremiah Ronayne, Lavally; â¬20 Barry Kennedy, Glenville. Next jackpot â¬12,500. Draw takes place on Friday 21st February in Railway Bar, Ballinamona. The following are the Lotto results for Friday 7th February. Numbers drawn:14,18, 28, 29. There was no jackpot winner. Spot Prizes: â¬50 Steve OâSullivan, Monaparson, â¬30 Mark OâSullivan, Monaparson, â¬20 Vincent OâConnor, C/o Jerry OâDonoghue, â¬20Patsy Browne, C/o Jerry OâDonoghue, â¬20 Padraig OâConnor, Rockvale. The following are the Lotto results for Friday 31st January. Numbers drawn:5, 14, 25, 28. There was no jackpot winner. Spot Prizes: â¬50 Mary Fuller, Mallow, â¬30 Martin OâConnor, C/o Juvenile Club, â¬20 Marie Aherne, Ballyclough, â¬20 Ellen OâRiordan, Avondale Park, â¬20 Billy & Garry Deane, C/o Clive Deane. Next jackpot â¬12,500. Draw takes place on Friday 31st January in Conwayâs Bar,, Burnfort. The following are the Lotto results for Friday 24th January. Numbers drawn 7,18,20,22. There was no jackpot winner. Spot Prizes: â¬50 Jonathon O Connor Ballinamona, â¬30 Nicola O Connor Cappamore, â¬20 Tom Cashman Bottlehill, â¬20 Kira O'Sullivan Garranagearagh, â¬20 Dave O Sullivan Clashmorgan. Next jackpot â¬12,500. Draw takes place on Friday 31st January in The Railway Bar Ballinamona. The following are the lotto results for Friday 17th January. Numbers drawn 5,11,22,25. There was no jackpot winner. Spot prizes ; â¬50 Buckley Family Clashmorgan, â¬30 Mary Golden Nadd, â¬20 Kit O Shea Burnfort, â¬20 Michael Dorgan Toureen, â¬20 Paddy O Connor Ballinamona. Next Jackpot â¬12,500. Draw takes place on Friday 24th January in O Mahoneys Bar Bottlehill. The following are the lotto results for Friday 10th January. Numbers drawn 2,11,22,30. There was no jackpot winner. Spot prizes ; â¬50 Andy Bourke Castlemagner, â¬30 Marjorie Cronin Springwood, â¬20 Rory Flannery c/o W Cronin, â¬20 Catherine Crowley Glynn, â¬20 Roy Browne Ballinvoskig. Next jackpot â¬12,500. Draw takes place on Friday 17th January in Conways Bar Burnfort. The following are the lotto results for Friday 13th December. Numbers drawn 1,16,23,30. There was no jackpot winner. Spot prizes : â¬50 Michael Cashman c/o The Hill, â¬30 Mick O Connell Upper Quartertown, â¬20 L&E Hennigan c/o Juvenile Gaa, â¬20 Lily Duggan Lower Dromore, Christmas Hamper Tess Finn Dromahane. Next jackpot â¬12,500. 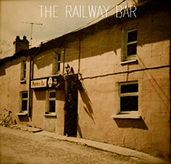 Draw takes place on Friday 20th December 2013 in The Railway Bar Ballinamona. An additional spot prize of a Christmas Hamper will be included in this draw. The following are the lotto results for Friday 22nd November. Numbers drawn 4,5,7,8. There was no Jackpot winner. Spot Prizes : â¬50 Lil Cunningham c/o J O Donohue, â¬30 Liam O Connor Cappamore, â¬20 O Connor Family Ashview, â¬20 John Cronin Carrigoon, â¬20 John & Patricia Walsh Clashmorgan. Next Jackpot â¬12,500. Draw takes place on Friday 29th November in Conways Bar Burnfort. The following are the lotto results for Friday 16th November. Numbers drawn 5,14,19,26. There was no jackpot winner. Spot prizes ; â¬50 Colm O Mahoney Bottlehill, â¬30 Benny Doherty Newmarket, â¬20 Joan Murphy Dromahane, â¬20 Mary O Shea Ballyhillogue, â¬20 Jerry O Donohue Knuttery. Next jackpot â¬12,500. Draw takes place in Friday 22nd November in The Railway Bar Ballinamona. The following are the lotto results for Friday 8th November. Numbers drawn 11,12,19,31. There was no jackpot winner. Spot prizes; â¬50 Gavin Dennehy c/o G Dennehy, â¬30 Colin Kelly Knockbrack , â¬20 Eamon Geurin Lombardstown, â¬20 Mick O Shea Garranagearagh, â¬20 Tommy Walsh Clashmorgan. Next jackpot â¬12,500. Draw takes place on Saturday 16th November in O Mahoneys Bar Bottlehill. The following are the lotto results for Friday 1st November. Numbers drawn 4,14,24,31. There was no jackpot winner. Spot prizes; â¬50 Ann Hayes Island, â¬30 John Goulding Fiddane, â¬20 Geraldine Fleming c/o Juvenile Gaa, â¬20 Pat Moynihan Rathduff, â¬20 Jim Coakley Cork. Next Jackpot â¬12,500. Draw takes place on Friday 8th November 2013 in Conways Bar Burnfort. The following are the lotto results for Friday 18th October. Numbers drawn 6,21,23,25. There was no jackpot winner. Spot prizes; â¬50 Raymond Murphy Rathduff, â¬30 Connie Fitzpatrick Fiddane, â¬20 Mick Cashman c/o The Hill, â¬20 Lucy O Mahoney Bottlehill, â¬20 Danny McAuliffe Mallow. Next jackpot â¬12,500. Draw takes place on Friday 25th October 2013 in O Mahoneys Bar Bottlehill. Numbers drawn 6,19,20,21. There was no Jackpot winner. Spot prizes ; â¬50 Siobhan Sheehan c/o Juvenile Gaa, â¬30 Ann O Donovan Ballyhillogue, â¬20 Jimmy Ronayne Knuttery, â¬20 Maire Fitzpatrick Garrynagearagh, â¬20 Kitt O Shea Burnfort. Next Jackpot â¬12,500. Draw takes place on Friday 18th October in Conways Bar Burnfort. The following are the lotto results for Friday 13th September. Numbers drawn ; 11,22,29,31. There was no Jackpot winner. Spot prizes ; â¬50 Eva O Donohue c/o J O Donohue, â¬30 Alan Sheehan c/o J O Donohue, â¬20 Mary Walters Newmarket, â¬20 Colin O Mahoney c/o DJ Browne, â¬20 Niall Cronin Greenhill. Next Jackpot â¬12,500. Draw takes place on Friday 20th September in The Railway Bar Ballinamona. LOTTO RESULTS: The following are the Lotto results for Friday 26th July. Numbers drawn 6,7,10,29. There was no Jackpot winner. Spot Prizes: â¬50 Louise Forde Knuttery, â¬30 Orla Murphy c/o D Murphy, â¬20 Tess Mannix Lavally, â¬20 Carmel O Sullivan Monaparson, â¬20 Derry Murphy Railway Bar. Next Jackpot â¬12,500. Draw takes place on Friday 2nd August in O Mahoney's Bar Bottlehill. Draw takes place on Friday July 19th 2013 in Railway Bar, Ballinamona. The following are the lotto results for Friday 7th June. Numbers drawn: 9,10,18,26. There was no Jackpot Winner. Spot prizes : â¬50 Billy Cronin Clogheen, â¬30 Con Cronin Castlebarrett, â¬20 Breda McGrath 20 Dromore Drive Mallow, â¬20 Donie Foley C/O D Murphy, â¬20 Chris Kenny Lahakineen. Next Jackpot â¬12,500. Draw takes place on Friday 14th June in Conways Bar Burnfort. Draw takes place on Friday May 17th 2013 in Railway Bar, Ballinamona. The following are the lotto results for Friday 3rd May 2013. Numbers drawn: 7,18,21,26. There was no jackpot winner. Spot prizes: â¬50 John Walsh Clashmorgan, â¬30 Francis Lane c/o D Murphy,â¬20 Alan Sheehan c/o J O Donohue, â¬20 Tom Buckley Ballyknockin, â¬20 Eamon Doherty Knuttery. Next jackpot â¬12,500. LOTTO RESULTS: The following are the lotto results for Friday 19th April. Numbers drawn; 2,5,9,26. There was no Jackpot winner. Spot prizes : â¬50 Sean Gyves c/o Tara Telecom, â¬30 Patsy Daly Knockbrack, â¬20 Lil Cunningham c/o J O Donohue, â¬20 Michael Buckley c/o John Buckley, â¬20 Veronica Barrett Rockhill. Next Jackpot â¬12,500. Draw takes place on Friday 26th April 2013 in The Railway Bar Ballinamona. The following are the lotto results for 15th march. 6,11,19 and 20 were the numbers drawn and there was no jackpot winner. â¬50 Gerard O'Sullivan Greenhill,â¬30 Jill Lucey Ballinamona and the three winners of â¬20 each were Jack O Sullivan Fiddane, Kay Cahill Bottlehill and Billy Hayes Cork Rd Mallow. Next draw takes place this ffriday night in Conways Bar Burnfort. The Following are the lotto numbers for 22nd February, 9,17,21,25. There was no jackpot winner. Spot prizes â¬50 Fidelma O Leary Gortaneelig, â¬30 Brendan Cronin Barrinclay â¬20 Hillary Williamson Ballyknockin â¬20 Tim McCarthy lahakineen and â¬20 Michael Cotter Burnfort. Next Draw takes place friday March 1st in Conways Bar Burnfort. The following are the lotto results for Friday 8th February. Numbers drawn; 12,15,27,31. There was no jackpot winner. Spot prizes: â¬50 Tom Cashman c/o Bottlehill, â¬30 Ollie O Hanlon Clashmorgan, â¬20 Dan Joe Mahoney Knockbrack, â¬20 Eamon Geerin Lombardstown, â¬20 Paddy Dorgan Greenhill. Next jackpot â¬12,500. Draw takes place on Friday 15th February in O Mahoneys Bar Bottlehill. Knockbrack, â¬20 John Walsh Clashmorgan. Next Jackpot â¬12,500. Draw takes place on Friday 1st February 2013 in The Railway Bar Ballinamona. Draw takes place on Friday January 18th 2013 in Conway's Bar, Burnfort. LOTTO RESULTS: The following are the lotto results for Friday 7th December. Numbers drawn: 7,15,25,28. There was no Jackpot Winner. Spot prizes: â¬50 Brona Flynn Grenagh, â¬30 Jerry O Donohue Knuttery, â¬20 Helen Creedon Clogheen, â¬20 Mick O Shea c/o Clyda Rovers, â¬20 Eileen Philpott c/o Donie Mulcahy, Christmas Hamper Veronica Barrett Rockhill. The following are the Lotto results for Friday 30th November. Numbers drawn: 5,16,30,32. There was no Jackpot Winner. Spot Prizes: â¬50 Kevin Dennehy Rathduff, â¬30 John Lane Lackanamona, â¬20 Noel Carey Lavally, â¬20 Sean Hickey Dromahane, â¬20 Liam Cronin Ashbrook Mallow. Next Jackpot â¬12,500. Draw takes place on Friday 7th December in Conways Bar Burnfort. The following are the Lotto results for Friday 23rd November. Numbers drawn 6,15,25,28. There was no Jackpot Winner. Spot Prizes: â¬50 Joss Breen Dungarvan, â¬30 Jerry O Sullivan Island, â¬20 Ann Murphy Knockanannaig Mallow, â¬20 Jack O Sullivan Fiddane, â¬20 Brendan O Brien Ballymorisheen Grenagh. Next Jackpot â¬12,500. Draw takes place on Friday 30th November 2012 in O Mahony's Bar Bottlehill. The following are the lotto results for Friday 9th November. Numbers drawn: 6,21,30,31. There was no Jackpot Winner. Spot Prizes : â¬50 Ann Hayes Island, â¬30 Eileen Buckley Greenhill, â¬20 Jerry O Mahoney Bottlehill, â¬20 Emer O Callaghan Dromore, â¬20 Dennis Carey Toureen. Next Jackpot â¬12,500. Draw takes place on Friday 16th November in The Railway Bar Ballinamona. LOTTO RESULTS: The following are the lotto results for Friday 26th October. Numbers drawn 12,16,24,29. There was no Jackpot Winner. Spot Prizes: â¬50 Fidelma O Leary Gortnaleigh, â¬30 Barry Mullane Toureen, â¬20 Julie Greene Lissard, â¬20 Padraig O Mullane Monaparson, â¬20 Caoilfhionn Brophy Clashmorgan. Next Jackpot â¬12,500. Draw takes place on Friday 2nd November at Conways Bar Burnfort. The following are the lotto results for Friday 19th October. Numbers drawn: 12,16,24,29. There was no Jackpot winner. Spot Prizes: â¬50 TJ Lyons Mallow, â¬30 Tadhg Breen The Square Boherbue, â¬20 Tess Mannix Lavally, â¬20 Mick Maunsell Lissard, â¬20 Breda McGrath Dromore Drive Mallow. Next Jackpot â¬12,500. Draw takes place on Friday 26th October in The Railway Bar Ballinamona. LOTTO RESULTS: The following are the lotto results for Friday 12th October. Numbers drawn 1,19,20,27. There was no Jackpot winner. Spot Prizes : â¬50 Tommy Dorgan Island, â¬30 Daniel O Mullane c/o Railway Bar, â¬20 Lily O Connor c/o Conways, â¬20 Darragh Cronin Barrinclay, â¬20 Jerry Considine Ballydaheen. Next Jackpot â¬12,500. Draw takes place on Friday 19th October in O Mahoneys Bar Bottlehill. LOTTO RESULTS: The following are the lotto results for Saturday 6th October. Numbers drawn 3,17,19,21. There was no Jackpot Winner. Spot Prizes: â¬50 Jerry O Donohue Knuttery, â¬30 Katie Murphy Rathduff, â¬20 Derek O Mahoney Knockbrack, â¬20 Tom Wallace Dromore, â¬20 F Hegarty Glenville. Next Jackpot â¬12,500. Draw takes place on Friday 12th October in Conways Bar Burnfort. LOTTO: The following are the lotto results for Friday 28th September. Numbers drawn 14,22,25,29. There was no Jackpot Winner. Spot Prizes: â¬50 Cormac Murphy Ballinamona, â¬30 Kitty Walsh Croke place Mallow, â¬20 Daniel Mullane Monaparson, â¬20 Noel O Callaghan Knuttery, â¬20 Jerry O Donohue Knuttery. Next Jackpot â¬12,500. Draw takes place on Saturday 6th October 2012 in The Railway Bar Ballinamona. The following are the lotto results for Friday 14th September. Numbers drawn 1,2,21,22. There was no Jackpot winner. Spot Prizes: â¬50 Kira O Sullivan Garrynagearagh, â¬30 Jerry O Donohue Knuttery, â¬20 David Sheehan Mallow, â¬20 Aaron Walsh Graigue, â¬20 Pat Moynihan Rathduff.